South Africa immigration statistics show that the number of permits and visa granted by the Department of Home Affairs has decreased by almost one third according to the latest statistics on 'documented immigrants in South Africa'. Foreign residents in South Africa can apply for various permit categories depending on their requirements. The two main types of residency permits which can be applied for are temporary or permanent residence permits. According to Statistics South Africa (StatsSA) and the Department of Home Affairs 73,352 foreign nationals (down from 109,000 in 2013) were granted residency status in South Africa in 2014. The majority of immigrants received temporary residence permits (94%) as only 4,136 permanent residence permits (6%) were approved and granted in 2014 (compared to 6,801 in 2013). Did you know? The provinces with the highest numbers of non-South African citizens are Gauteng (7.1%), North West Province (3.5%), Western Cape Province (3.2%), Mpumalanga (2.6%) and Limpopo (2.6%). Foreign nationals who want to live in South Africa have to apply for a residency permit, which can either be a temporary visa or a permanent residence permit. Temporary Residence permits, since the new regulations came in 2014 they are referred to as 'visa', are grated to all persons staying in South Africa for a limited period and applications can be made in various categories such as visitors permits, work permits, relatives permits, study permits or retired persons permit. Immigrants can also apply for Permanent Residence (PR) permits if certain minimum requirements and conditions, such as living in the country for a minimum of 5 years and being in possession of an unlimited work contract or being financially independent, are met. It is further interesting to know, that only only 3.3% of South Africa’s population of 51.7 million are considered as non-South African citizens whereas in the USA 14.3%, in Germany 11.9% and Russia 7.7% are considered immigrants. Who comes to live in South Africa? Again in the newest statistics, both types of permits show that the majority of immigrants come from countries such as Zimbabwe, Nigeria, India, China or the UK which are also the leading immigrant countries to South Africa historically. According to the newest StatsSA immigration statistics released in December 2015 on 'documented immigrants', the following observations are made. 53% recipients from Africa (34% from the SADC countries such as Zimbabwe and Nigeria) - down from 55% in 2013. 47% recipients from Overseas (Asia 30.6% - up from 27.1%, Europe 12.2% - down from 13.1%, North America 2.1% - down from 2.3%, Central and South America 1%, Middle East 1% and Australasia 0.6%) - up from 45% in 2013. India, China, Pakistan, Bangladesh, Uk, Germany and the USA received the highest number of Temporary Residence Permits - similar to 2013. Study Permits go mainly to African recipients. Over 86% of all study permits are granted to applicants from SADC countries, students from Zimbabwe, Angola, Nigeria, Lesotho and the DRC. Overseas students come in the highest numbers from the UK, Germany, France, the USA, and the Netherlands. Retired Persons Permits: Recipients come to the major part from the UK (30%) Germany (13.5%), South Korea (6.2%) and the Netherlands (4.8%). Medical Treatment Permits: These permits are granted to medical patients who stay over 3 months in South Africa. This kind of permit is mainly granted to people from other African countries such as Angola, the DRC, Zimbabwe and Nigeria. Work Permits: 63% of all Chinese recipients of temporary permits are granted work permits, whereas 21% (up from 18% in 2013) were here on a visitor permit. 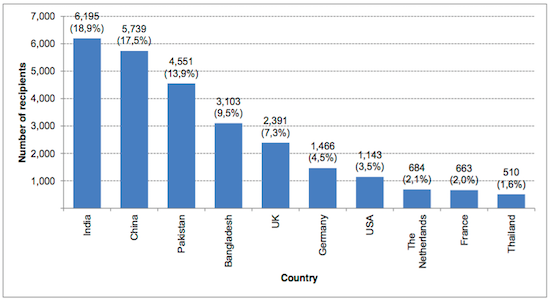 Four out of the top ten countries receiving high numbers of work permits were from Asia, such as China 22.6%. UK figures are the highest for European nationals with temporary work permits, with 2.1%. Business Permits: Pakistan, Bangladesh, China, and India nationals together received about half (51.3%) of the permits. Visitor Permits: Zimbabwe, Nigeria and India received almost half (47.8%) of the permits. Visitor permits constitute the largest type of the total number of permits received for Netherlands (57.3%), Germany (52.5%), USA (53.8%) and the UK (48.2%). Relative's Visa: 54.7% of all visa went to nationals from two African countries (Nigeria and Zimbabwe) and two Overseas (Asian) countries, namely Pakistan and Bangladesh. Over 77% of these permits go to these top 10 countries: Zimbabwe, India, China, DRC, Nigeria, UK, Lesotho, Pakistan, Germany and Zambia. About 50% of recipients of PR status are between the ages of 20 and 44 years. 27% of all permanent permits are given to children, aged 15 years or less. The vast majority of the holders (93%) are granted using the work (29.7%) or relatives category (63.1%) status. Only a small number 4% of all permanent residency permits are granted to refugees. These come mainly from the DRC, Somalia, Congo and Ethiopia. Retirees are only a tiny fraction of all holders of PR status (2.2%) and come mainly from Europe (64%) and there mainly from the UK, Germany and the Netherlands. 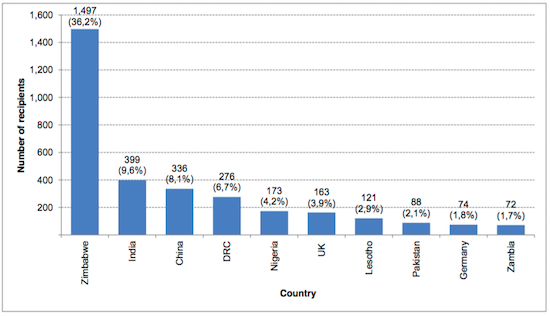 In the Business category, of all PR permits granted, go to: China 24%, Bangladesh 7%, Ethiopia 7%, UK 7% and Germany 5%. It is to note that, while the number of granted temporary permits had already decreased by more than 40% from 2012 to 2013, the number decreased again more than 33% from 2013 to 2014. The number of permanent permits which were granted in 2013 had then increased by 500% but in 2014, the percentage of PR permits granted stayed at the same 94%/6% level as in the previous year. The high discrepancy in the numbers of granted permits in the last two years are described in the report as a ‘reflection of the processing procedures and regulations’ and although the numbers of the processed and granted permits are difficult to compare, the ‘pattern of the types of permits remained virtually the same’. 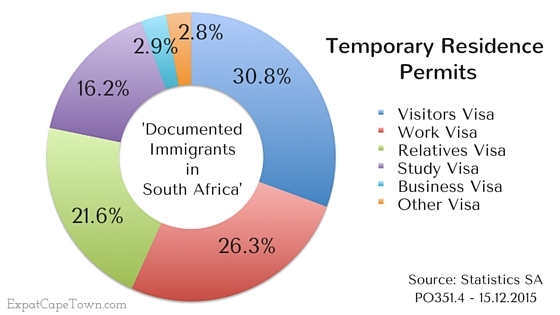 The introduced changes to the immigration regulations in 2014 show that the pattern and distribution of issued permits did not vary, however, in regards to the total number of permits granted for immigration to South Africa, there is a sharp decline in officially documented new immigrants noted. This decline can in parts also be considered related to the established new VFS visa facilitation centres and decreased number of permits received due to the new regulation requirement of the visa applicants being present when submitting the application and the low number of VFS offices in several countries. How these numbers will change once the VFS facilitation centres run more smoothly and more offices are implemented especially in China and India remains to be seen in the next statistical set which is only expected to be published later this year. Read more about the latest changes to the immigration regulation here. Please take note: The DHA gives only information on processed applications for temporary and permanent residency. No information is given on the number of applications received by the Department of Home Affairs in 2014, thus the figures only relate to permits which have been granted. Further no information has been found regarding the number of refugees and asylum seekers and undocumented immigrants without permits and excluded are all kinds of residency applications which are still pending or were refused in 2014. Source for South Africa Immigration: StatsSA PO351.4 - published 15 December 2015. Regina Gräff is the founder and editor of ExpatCapeTown.com and and co-author of the 'Living in South Africa' handbook. Born and raised in Germany, she has a MA phil degree in languages and intercultural communication. Regina is a serial expat and has worked as a teacher and educational consultant in various countries including the USA, Australia, Singapore and the UK. Since 2005, she lives with her family in Cape Town/South Africa. Uploaded page on South Africa Immigration on 4 March 2016. 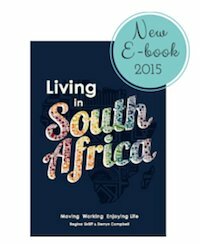 Have you seen our e-book?